Get ready to wire your Swamp Cooler to run from a battery or from your Solar Power Station. Hey, this tutorial will be more techy than some others, but you can do it! If you’re new to the PlayaLabs, start with the other Tutorials and come back when you’re ready. You can run your Swamp Cooler from a 12-Volt battery for a few hours a day and you’ll get through the Burn before the battery dies. This is the simplest way. But if you want more power to run other gadgets, you can wire the Swamp Cooler to a Solar Power Kit. It’s up to you. Either way, you’ll need a 12-Volt Battery. If you don’t have one yet, you can TEST the swamp cooler with your car battery during this build. But do NOT use your car battery on Playa! It’ll drain too much power. Your Swamp Cooler should be 99% built by now. If not, go back and finish. When you’re ready to wire it: The PlayaLabs has researched and found the least expensive and easiest way for beginners (that still gets good results). It’s definitely not the only way! Take your extra 25 ft wire. Cut an 18-inch length off the wire. Pull apart the red and black sections about 2 inches on each end. Now that you know how to use the strippers, move on to the pump: pull the red and black wire tips apart about 2 inches, and strip ½ inch of insulation off each tip. The wires are very thin so be careful stripping! 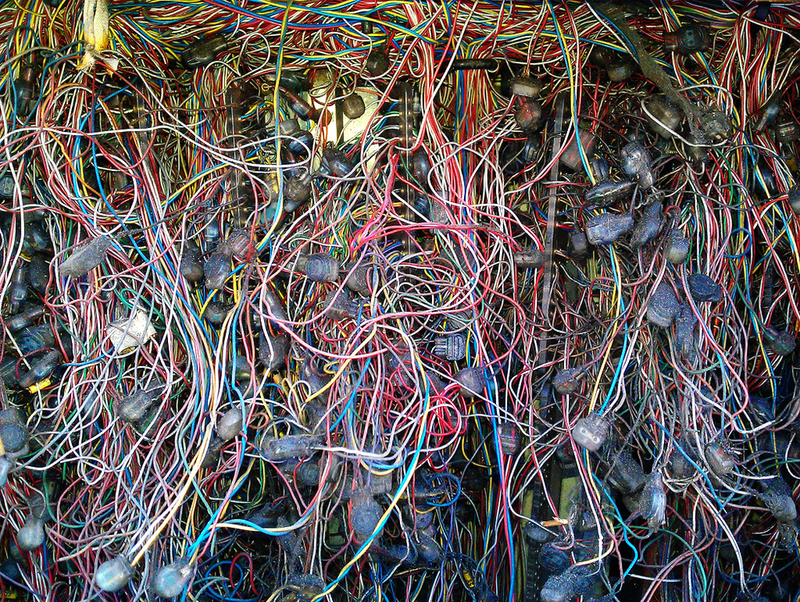 It’s tricky to insert the wires correctly. 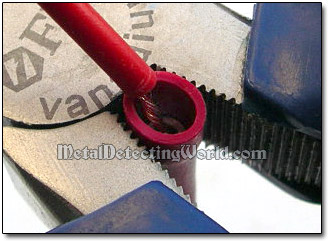 You want to make sure that both metal wire tips are inserted fully into the inner metal sleeve inside the Barrel Connector. The exposed metal of Wire 1 and Wire 2 should be fully inside the inner metal sleeve: Yeah it’s hard to describe but look at the diagram above. Look closely and make sure everything is lined up. Once it’s lined up, crimp the barrel connector with your wire tool or pliers. You are just trying to squeeze the metal connector enough to crimp the wires, it doesn’t take a lot of pressure. You will end up with this: Tug gently on the wires to make sure they are secure. Repeat with the black wires from the pump. Now, you will repeat the process for the FAN. Carefully strip ½” of insulation from the red and black wires coming from your fan (ignore the blue wire). Use barrel connectors to connect the black fan wire to the black extension wire. Repeat with the red wires. You still have a ~20 foot long piece of extra wire. Peel the black and red sections apart a few inches on one end and strip off ½” of insulation from the red and black wires. Take one black-wire tip from the extra long wire, and grab the black wire tip from the PUMP and the black wire tip from the FAN. You should have 3 black wire tips in your hand. Line up all 3 wire tips perfectly even, then twist all 3 of these wires together like so. Repeat with the 3 red tips from the Fan, Pump, and Extension wire. Ok we are almost done! Gently tug on all wire connections to make sure they are secure. Repeat with the BLACK wire and BLACK gator clip. Add some water to the swamp cooler. DO NOT run the pump when dry. Put the pump down inside the bucket and put the lid on, taking care not to pinch your wires. We linked to a 50 Amp-Hr battery. This is a small, inexpensive power source that will run the swamp cooler for a few hours a day, for about 5 days. If you are frugal, this simple setup will get you through the event. If you want more power, consider the Solar Power Kit tutorial. The fan and pump should jump to life. To turn it off, simply unclip a gator clip. Clip it onto the handle of the battery or some other plastic object nearby so you don’t tangle it. Do not connect your fan or pump to an inverter or any other A/C power source. Only connect directly to a 12V DC battery. When you get home, charge up your 12-Volt Battery with this cheap little charger. Leaving it drained is not good for the battery. If you are pairing with a solar panel kit, set up the solar station as described in our other Tutorial first, then clip on the Gator Clips to the battery as the last step. Once you clip the gator clips, the fan and pump should jump to life. If not, DISCONNECT the gator clips from the battery before any troubleshooting. Unclip the battery, untwist the wire nuts, and make sure the three blacks and three red wires are all lined up and twisted together well. Re-do the wire nut. You may need to try a larger or smaller wire nut. Fan Runs, but not Pump (Or vice versa). Fan or Pump is dead? 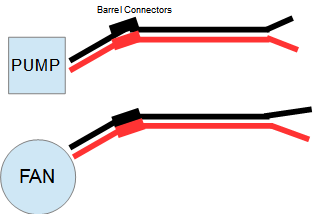 A Barrel Connector is loose. Unclip the battery. Gently tug the barrel connectors.. You may have to re-cut and start over. Do not cut too much off the Fan and Pump wires, they are too short already. Use excess wire from your 20 foot extension wire. Make sure you stripped enough insulation (but not too much) so the metal part of the wires fits into the sleeve inside the barrel connector. Don’t over crimp the barrel connector. Turn off your swamp cooler! Unclip one of the gator clips. Otherwise you drain the battery and kill your pump.